There is really no way to know for sure, but Deb Carey, cofounder of the New Glarus Brewing Co., thinks her brewery’s launch nearly 25 years ago was the fastest microbrewery startup ever. She and her husband, Dan Carey, first talked about launching a brewery in January 1993. They drew a 30-mile circumference around Madison, Wisconsin, shortly thereafter, and Dan used soon-to-expire frequent-flier miles in February to scope potential sites. By June, the couple, then both 33, and their two elementary-school-age daughters had relocated in U-Hauls to the town of New Glarus from Fort Collins, Colorado, where Dan had worked as a brewing supervisor at mighty Anheuser-Busch. Why New Glarus? And why 1993? Deb Carey was born in Milwaukee and grew up in Eau Claire and Chippewa Falls, both in Wisconsin. Plus, during that February trip in the dead of a typically unforgiving Upper Midwest winter, Dan had stopped for gas in New Glarus on his way to see a friend in the brewing business in Monroe, Wisconsin. New Glarus reminded the San Francisco native of a town he and Deb had lived in near Munich during a brewing apprenticeship at Ayinger. Besides, he noticed a warehouse for sale. Dan forgot to the get the number on the side of the building; and Deb, in those pre-Google days, had to get on the phone to local businesses to track down the warehouse’s owner. That owner was willing to trade a year of occupancy for stock in the future brewing company. So the space was settled. Equipment came via secondhand dairy gear and a Small Business Administration auction of a failed brewpub in Appleton, Wisconsin. Technical expertise came via Dan, who had studied brewing at the University of California-Davis and the Siebel Institute. Business expertise came via Deb, who had been launching her own entrepreneurial concerns going back to her late teens, including a furniture-importing business when the couple lived in Oregon. 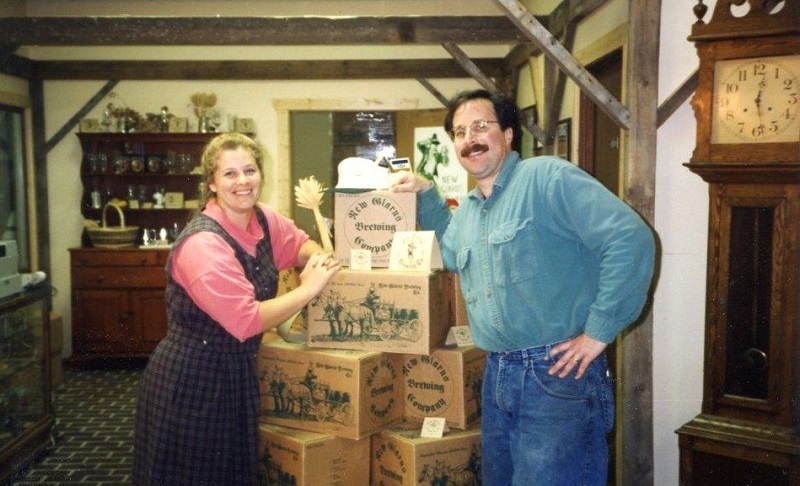 The initial seed money for New Glarus—which the two incorporated with the state of Wisconsin in April 1993, barely two months after the town of New Glarus charmed a gassing-up Dan Carey—came from investors such as the warehouse owner and from the Careys’ selling their Fort Collins house. Once ensconced in the Badger State, it was time to go for broke. New Glarus’ first release, a pilsner called Edel Pils (which it will re-release as part of its 25th-anniversary celebration next year), debuted in September 1993; and the brewery moved about 300 barrels in its first year. The number crept upward from there. But within that production rise lay a curious feature of New Glarus even more improbable than the Careys’ fast startup window: The brewery has largely only distributed in Wisconsin, a state that had just over 5 million residents in 1993 and that still ranks toward the American middle population-wise—California or Texas, it ain’t. Still, the approach has worked: New Glarus is today one of the nation’s 20 largest craft operations—and 25 breweries overall—in terms of beer sales volume, per the Brewers Association’s latest figures. For a while in the mid-1990s, just after its launch, New Glarus did distribute in the Chicago area about 140 miles to the southeast and one state over. But Deb Carey, who did the brewery’s sales calls its first few years, tired of the commute in and out of America’s third-largest city and realized New Glarus could still grow without the Illinois accounts. The couple, after all, had relocated to Wisconsin from Colorado in part because Dan Carey had wearied of working rotating shifts for Anheuser-Busch as a brewing supervisor. They wanted off the treadmill, so to speak, even if it meant that it took the Careys about 10 years at New Glarus to match Dan’s salary at the world’s biggest brewery. This column originally appeared in All About Beer.